What we wouldn’t give for some of that $5.19 per gallon diesel right now. After we arrived back from Ghana on Sunday night we went to the Total station on Monday morning to fill up the pickup but they didn’t have any. After trying a couple of other stations, we became aware that no one in town had any gasoil (diesel). We had about 1/4 of a tank left but we want to leave a little in for a possible emergency, so the pickup has been parked. It really reinforced my fears of how vulnerable we are to the gas cartel of the mid-east, even though I think this is Nigerian fuel. Mentioning Nigerian fuel, I think this is the appropriate time to tell you about the black market gasoline that flows here across the border. 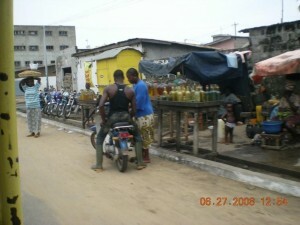 Along every road inside and outside of the city are little mom and pop stations that sell this type of gas and gasoil. The motos are their most frequent customers as it is sold cheaper than the regular stations. It comes into the country in five gallon black containers, and the border guards on both sides just turn their heads, probably for a small payment. The gas is poured into smaller containers, mostly two liters and a few larger round glass ones that hold at least five liters. Then it is poured into the tank with a funnel with a cloth over the funnel for a filter. It isn’t refined as well as the regular stations so it emits a steady stream of pollution, hence my term for the motos, ‘smoky motos’. I think you can guess why we have not resorted to these stations for the pickup! I will add, however, that the government is trying to shut them down because of the pollution. But it seems as if that is an effort in futility as there are so many and they have an abundance of customers. If they shut one down they just go down the street a ways and start again. Every once in awhile we see a moto carrying so many of the empty black containers that you cannot see the driver or the moto itself. Wednesday and Thursday Elder and Sister Hill came to Cotonou from the West Africa Area office to visit with us about safety. He has had extensive training in the military in security and is well qualified to put the fear in all of the missionaries and us. He wanted to take pictures of everyone just in case of a kidnapping and a picture of the apartment entries for security reasons. He told a few horror stories of things that have happen to some missionaries and how to be aware of your surroundings when on the streets. We have never felt threatened here, but I guess it pays to be a little cautious. Each of our apartments is like a fortress and needs at least three keys to get in and out. All of the widows have bars just like a prison so we are not encouraging anyone to be dishonest by making it easy to get in. (Boy, you can not be in a hurry to get in and out, and it can be very frustrating for someone who doesn’t even own a key to our front door at home.) Sometime we should describe the process of putting the pickup into the garage and getting ourselves in the apartment and getting all locked in for the night but it might overload the Internet, so we won’t. 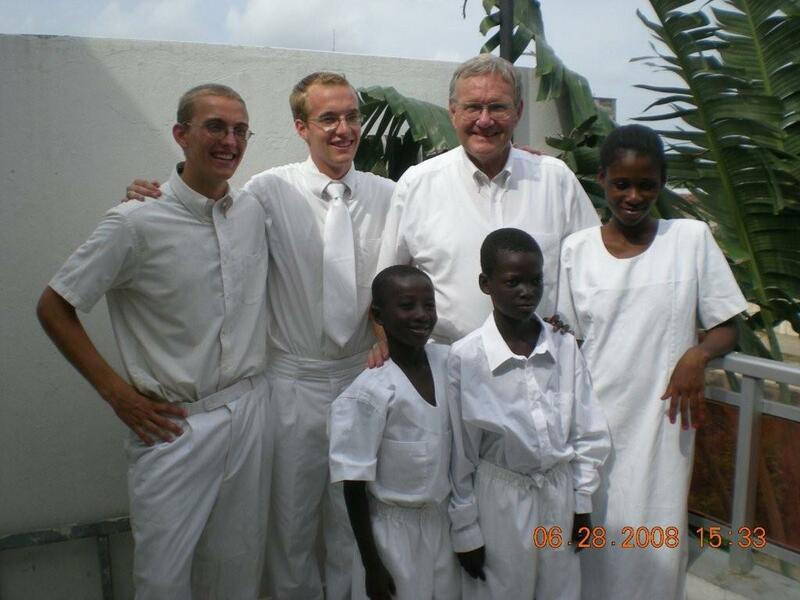 Elder Hill did stress that almost all incidents occur when missionaries aren’t following the rules. In a city of 2 million people, there are bound to be a few dishonest ones, but we repeat again that we would far rather take our chances here than in Phoenix or maybe even Salt Lake City for that matter. Friday was also a red letter day for fuel. By paying about $500 in advance for fuel and getting a credit card we became a preferred customer so that we can buy fuel they won’t sell to the general public. We applied for that on Thursday and it was supposed to take until Monday to get the card but I think the little gal that was doing the processing was on our side a little because she called on Friday afternoon and told us the card was ready. Fortunately we had enough fuel left to drive down, get the card and go out to Fifadgi where there was a station with fuel and we are now again part of the Cotonou traffic problem. It seems good. Saturday we also baptized Jemima (Gmama). She is the one we mentioned from Liberia. She wanted me to baptize her. She is really a nice gal but we still have a lot of problem with Liberian English. Somehow we manage to communicate. I had to laugh a few days ago when Elders Adou and Foucher were going over to teach her. They both speak English but as a second language. I asked them who their next appointment was with and they said they were going over to Jemima’s and pray for the gift of tongues. I guess it must have worked. Two boys, Pacome and Obed were also baptized. They are the friends of the son of one of the members and lives there in the same little compound. The elders have been teaching them for a long time now and they have been coming to primary. 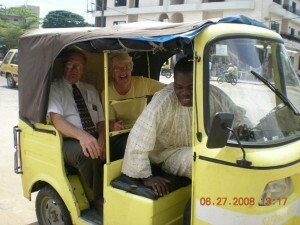 We also helped to teach them since the Elders need to have adults with them whenever they are teaching children. They are a couple of really sharp boys who know the gospel better than some adults. It was a really good baptismal service, and they were all confirmed in Sacrament meeting today. So we shelled out about $900 for the Internet for the next year. We did it with a smile because that is our link to the outside world. Not only the world with our family and friends but also the world of being part of the mission, getting supplies, transferring missionaries, etc. The telephone works some of the time but seems like the Internet is more reliable except for when it isn’t. We paid on Friday and the Internet hasn’t worked since. After Church today it was back up so maybe we are in business again. Talked to Ken and Amber and got to see Stetson crawl. Right in the middle the power went off so we lost them. 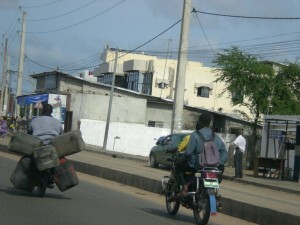 It’s all part of the fun of being in West Africa.